Sabina Ott has a metaphor for her artistic and educational philosophy, one that tangles together her belief in spontaneity, happy accidents and community ties: "That kind of tumbleweed roll where things grow because they organically pick up other people, places and things." 2015 was a tumbleweed year for the Art & Art History professor. She received a prestigious Guggenheim fellowship, leading to her upcoming exhibition with the Hyde Park Art Center. The Chicago Tribune featured her as the Chicagoan of the Year in Art. Through it all, she ran her gallery, Terrain, from her Oak Park home. 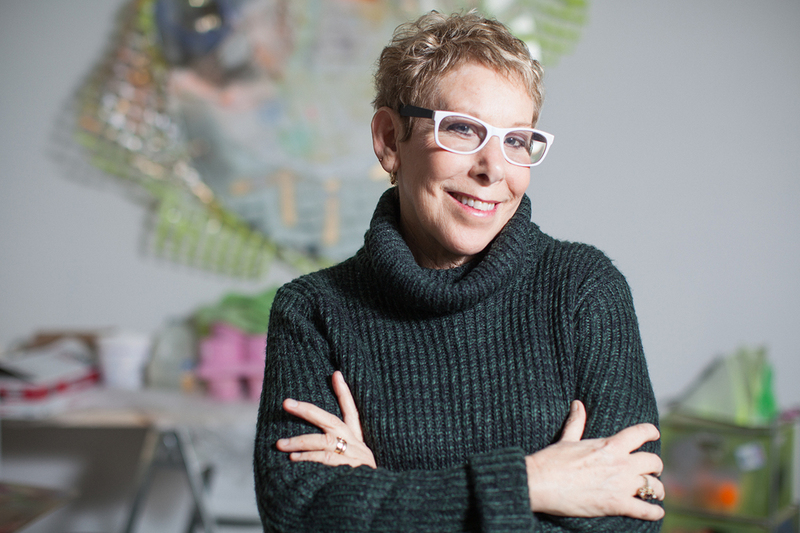 And a week into 2016, she’s already collecting new accolades: the College Art Association will honor her with a Distinguished Teaching of Art Award at a Feb. 3 ceremony in Washington, DC. Ott's Guggenheim project, "Who Cares for the Sky," opens Feb. 21 at the Hyde Park Art Center. When most people talk about building a mountain, they mean it figuratively, but Ott's project, by comparison, is pretty literal. "You'll walk into the Art Center and you'll be confronted with this white Styrofoam mountain," she explains. "There's a grotto and tunnels. There'll be work embedded in the sides. It's going to be crazy." After working in arts education for 30 years, Ott sees her teaching career as an extension of her artistic practice. "Columbia's been a big part of that," she says. "Having a secure position allows me to really delve deeply into my own research—and bring my students with me." When Associate professor of Art & Art History Melissa Potter nominated Ott for the CAA Distinguished Teacher of the Arts Award, she was overwhelmed with support from Ott's students and mentees. "She had the largest number of letters of anybody who was nominated," says Potter. "She's very well-loved in the community, as a teacher and a mentor." She continues on the reasons behind her nomination: "Even though I'm her colleague I feel that she's been a mentor to me. I think that her artistic practice and her gallery and her classroom are all extensions of the kind of mentorship I consider really exemplary in the arts." Ott also thinks Chicago's many colleges contribute to the city's thriving arts scene. "These kids come out and make great work. They're smart and active—and they stay in Chicago," she says. She sees Columbia's Art & Art History department as a small but intense arts program that—with the right nurturing—will rival the best programs the city has to offer.